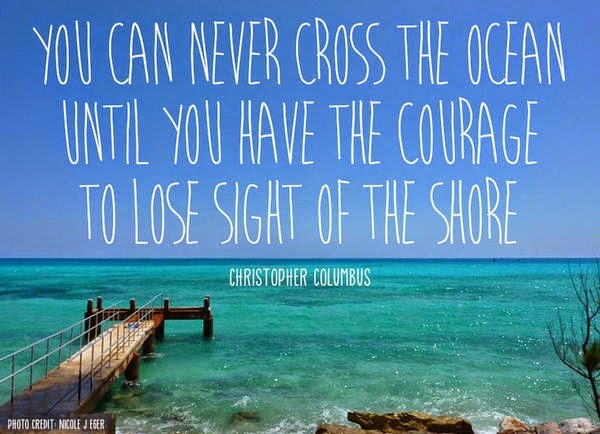 I remember someone telling me a long time ago that "you can never cross the Ocean until you have the courage to lose sight of the shore." If I'm completely honest with you, starting my MSc in OT was a big step for me. I knew I loved the field, I'd gained a lot of experience as an OTA and I knew that it was what I wanted to do. However, there was still a niggling feeling; a feeling of anxiety surrounding the step that I was taking. Would I be up to the challenge? The commute? The workload? There were a lot of unanswered questions, but I knew that if I really wanted to achieve my goals then I would have to have the courage to lose sight of what I knew. As you may already know, the first 7 weeks have flown by, literally. I can definitely say that I was right about the challenges that I would face, but If I'm honest - I'm coping and my initial anxiety is turning more into excitement by the day. I had been looking forward to my first proper placement as a student OT for weeks, in fact - long before I even started the course. I had been anticipating the amount of new skills and hands on experience that I would be gaining, along with the challenges of living and working in a new environment/location. When I found out that I would be working my first placement in acute medicine I had a split reaction. Fantastic, I can use the skills and experience I've gained from being an OTA in acute surgery and put them into practice during my placement. However, at the same time I was slightly disappointed that I wouldn't be faced with a completely new experience. Ultimately, I was completely surprised by the differences between working in a hospital setting in England compared to my previous experiences in Scotland. The differences that exist between treatment options and the process of assessment were miles a part; but both equally effective in their own way. For example, in Scotland the equipment is loaned out through a central store in each patients area, whereas in England - patients are given a prescription in which they can redeem from a list of approved retailers and not returned, or reused. Something that I particularly admired during my placement was the fact that OTs are highly valued throughout the multi-disciplinary team in that sense that Doctor's would approach OTs to ask advice and then make decisions accordingly. The role of OT was a respected one, and honestly... it made the profession feel important. Yet, going back to the quote I mentioned at the beginning of my blog which tells us to lose sight of the shore if we want to be challenged. If I'm being truthful, the shore was very much in my sight for the entirety of the week. I'm not saying that I wasn't challenged or that I didn't learn new and invaluable things. Instead, I felt a sense of control. I knew exactly what I was doing and I wanted to do more. I know that hospital placements differ from community placements, and I fully appreciate that - but I needed to be challenged, I needed to feel out of my comfort zone, and metaphorically speaking - I needed to be slam bang in the middle of the Ocean with no sight of the comforting shore...I needed to be lost. This placement I was introduced to SAAFA - Structured Anchored Approach to Formative Assessment, Wilby HJ (2005); which was a new approach to me and was created in response to a number of concerns by OT's in acute physical settings regarding consistencies of the assessments they were making and also in response to the changing shape of OT in an acute setting meaning that patients are discharged from hospital sooner; in turn affecting the amount of time OT's have to do their assessment. In the acute setting I had my placement in this meant that patients are seen over less encounters and are assessed using a number of observations around there bed space as a pose to being seen over a number of occasions to do separate kitchen/washing dressing assessments. This in turn does help the team to respond to the busy environment, and deal with the long waiting list that they have in department. It is important to note though that this doesn't impact on patient care as each patient is seen on an individual basis and evaluated accordingly meaning that the OT is not hindered by the to rigid a formula when treating a patient. It also benefited from the added input which comes from the OT always speaking to the next of kin/close relative of patient to determine a rounded understanding of the patients needs and home environment. In hindsight, am I glad that I wasn't completely paddling for my life out at sea? Yes and No. I learned a lot in the space of a week that challenged what I felt I already knew. I got the opportunity to speak with OTs and staff across the department and take advice where advice was on offer. But yes, I would have loved to be thrown in at the deep end; making assessments and being prompted for judgements. What I can say, is that I've paddled my way out to sea, comforted by what I already know, but challenged by what lies ahead. 37.5/1000 hours done towards qualifying as an OT! Wilby HJ (2005) A description of a functional screening assessment for the acute physical setting. British Journal of Occupational Therapy, 68(1), 39-44.